On my mom’s side of the family, I grew up eating authentic Italian cuisine. Buying premade, jarred sauce was sacrilege, and I am not going to be the one to disappoint. I have clear memories of my mom’s red sauce bubbling away on the stovetop for hours before topping a pasta or filling up a lasagna. Her traditional sauce includes ground beef and although it is delicious, even as a child, I remember picking out the meat. 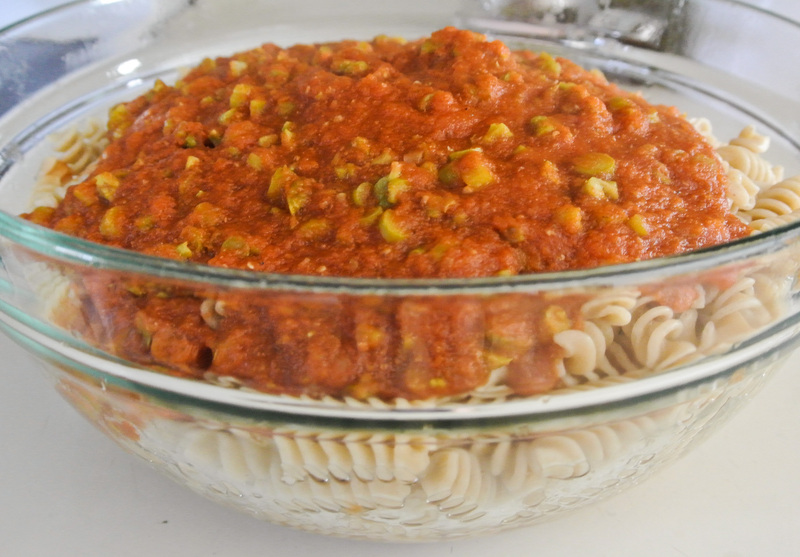 Today, I have my own totally vegetarian marinara recipe. When I met my husband of nearly four years, he expressed to me that he prefers his Italian cuisine without meat, too. I knew we were meant to be. 🙂 While he likes a sauce that is tarter, I have come to enjoy it best on the sweet side, as my mother adds a little bit of sugar when she’s making hers. 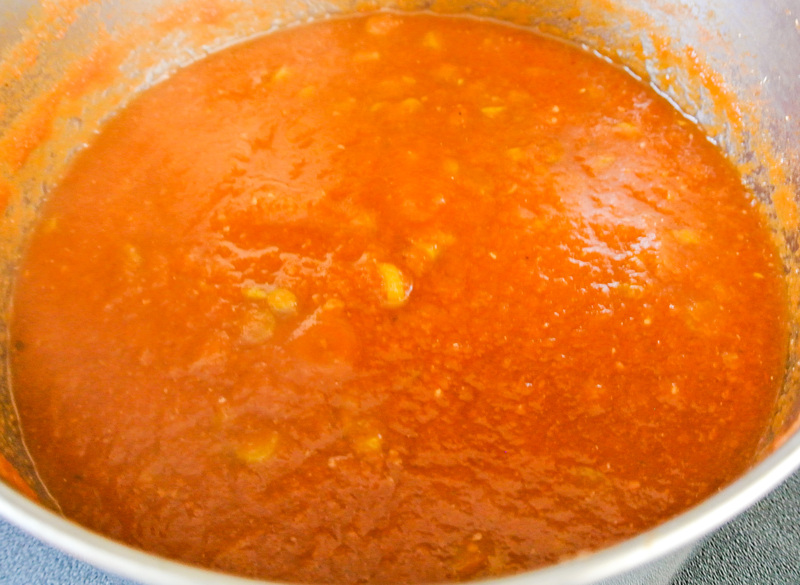 I used to make this recipe with canned tomatoes, simply because it’s quicker and will yield a slightly smoother sauce. After reading an article about the most dangerous foods you can put in your body and seeing canned tomatoes on the list, I have since opted for the path of more resistance. What’s so bad about canned tomatoes? 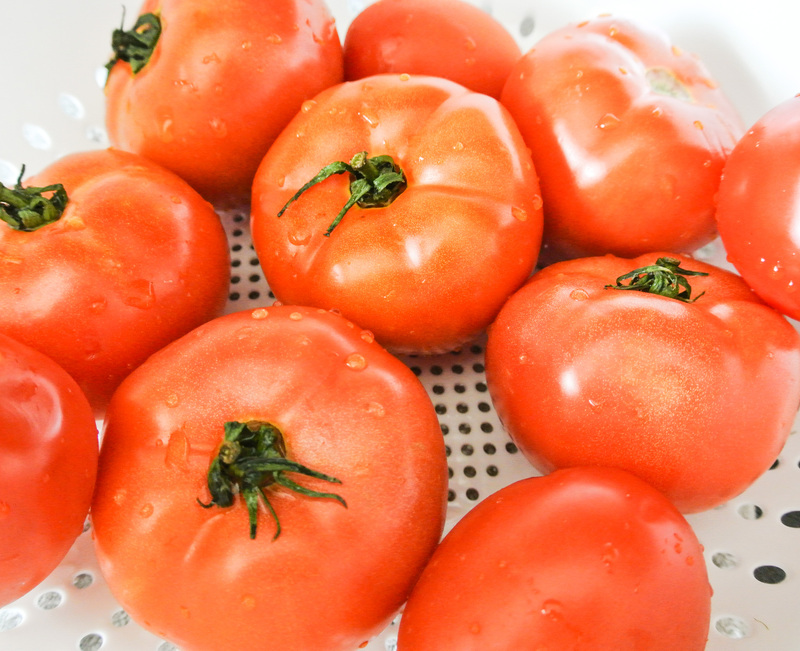 Cans are lined with BPA, and while some canned products do not contain enough acid to leach very much of this chemical into the food itself, tomatoes do and they will. So, I now puree my own tomatoes and the cooking process takes me a little longer. What’s the expression…Nothing that is worthwhile is easy? Something like that. Trust me, your sauce will be delicious and even though you are really really really starting from scratch, this recipe is still quite simple and will be ready in no time. 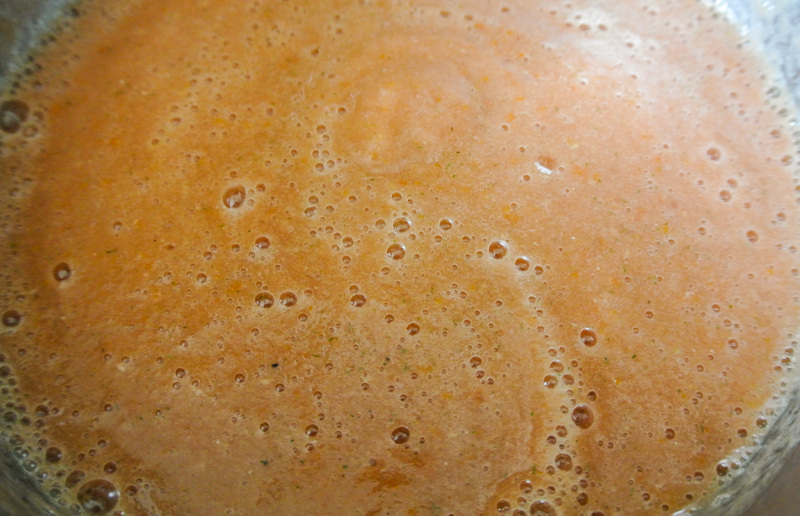 Use this sauce with your favorite Italian dish or try it out with my vegan pizza. Enjoy! 1 ½ pounds tomatoes –> I’m using a combination of vine ripe and roma. 2 tbsp sweetener (optional) –> I’m using turbinado sugar. 1 ½ tbsp dried fennel fronds (or a small handful of fresh) –> I’m using dried. 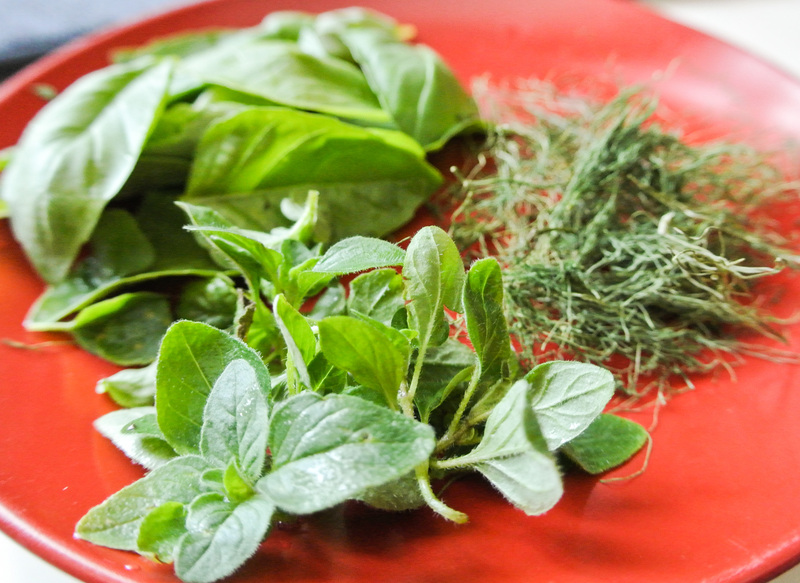 1 tbsp dried basil (or a small handful of fresh) –> I’m using fresh. 1 tbsp dried oregano (or a small handful of fresh) –> I’m using fresh. 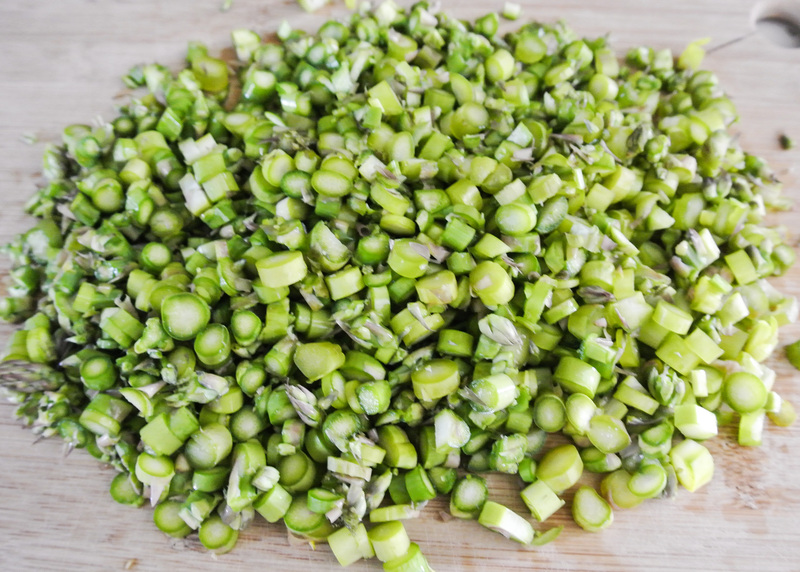 Thoroughly wash your vegetables so that you can save the scraps for homemade veggie stock. Coarsely chop your tomatoes and onion. 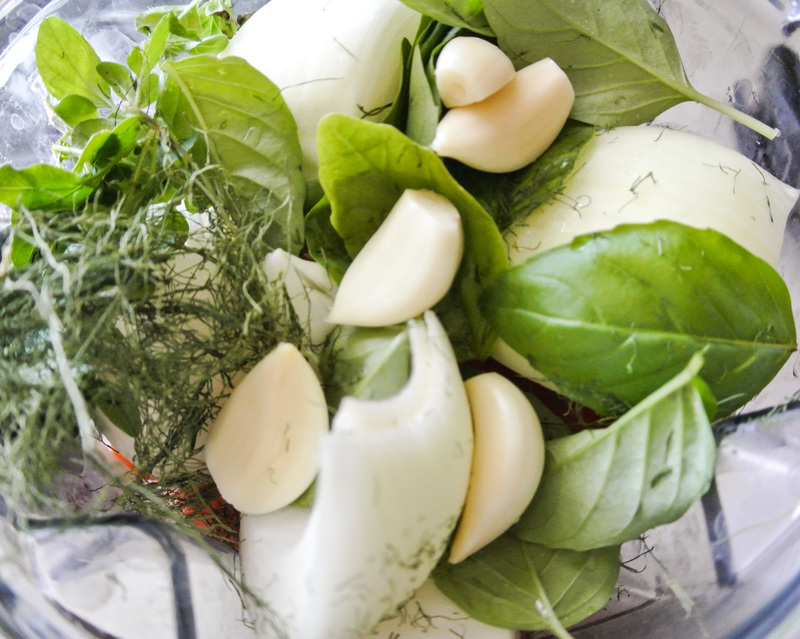 Throw them into a blender with your garlic, herbs (not the bay leaf), and seasoning and puree until smooth. Pour into a pot on the stove, add your bay leaf, and simmer on medium low for 1-2 hours, or until your sauce reduces by approximately one third. When I am just over the halfway mark, depending on what I’m going to be using the sauce for, I finely dice vegetables that I don’t anticipate my two-year-old being eager to eat and throw them in the pot. Today, I’m sneaking in some asparagus. I’ve pulled one over on Nolan a few times with great success. 🙂 You can skip this step if you want to keep this recipe extra simple. Remove the bay leaf and your sauce is ready! If you’re feeling adventurous and like to plan ahead, quadruple the recipe and freeze in containers the perfect size for a box of pasta. When “there’s nothing to eat” strikes, you’re ready for a quick pasta dinner! ← Let Everyone Eat Cake!